Ms. Celiac Says...: Try Some of Gilbert's Gourmet Goodies! For those of you looking for a cookie that is both gluten free and allergy friendly, why not check out Gilbert's Gourmet Goodies? In addition to being gluten free they also contain no peanuts, nuts, soy (with the exception of the chocolate chips), preservatives, milk, corn, or trans fats and are low in sodium! Currently, they sell cookie dough, giant cookies, and bite size cookies. 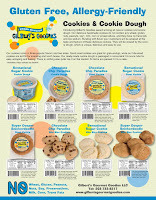 The cookie dough is available in 2 flavors: Sensational Sugar Cookie and Chocolate Chip Paradise. The giant cookies and bite size cookies are available in 3 flavors: Sensational Sugar Cookies, Chocolate Chip Paradise Cookies, and Super Dooper Snickerdoodle Bite Size Cookies. For more information, visit their website at www.gilbertsgourmetgoodies.com.